Welcome Home Children, Wonder when you will arrive. So anxious to see you both. Tomorrow afternoon we are going to Vic's and stay for supper, so should you return then you'll know where we are. No date on this postcard. Must be around the turn of the 20th century, though. This is has just been listed in my shop. I am glad to be able to participate in Postcard Friendship Friday today, now hosted by The Best Hearts are Crunchy blog. Visit her blog to see all the other posts for today. That is a lovely postcard. I think it must be from the early 1900's. Very nice! Thank you for joining us for PFF! That's a very sweet and pleasing card. Really pretty postcard. Love the colors, a good find. 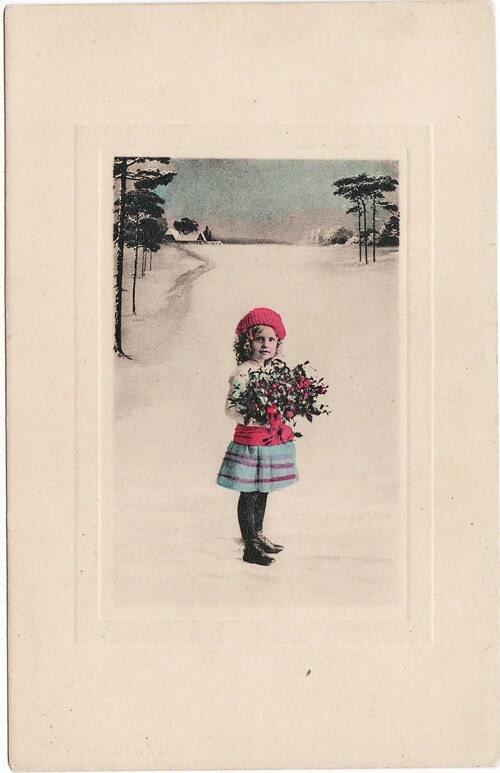 Lovely card, how do you know when the postcard was produced, I can't seem to find any dates on the ones I have. Pretty little girl but, brrr, makes me shiver. I've had enough of snow.